GNOME 3 (with GNOME Shell) is truly great and I especially like how easy it is to extend it through extensions like the new ThemeSelector extension. ThemeSelector GNOME Shell extension is a new, unofficial GNOME Shell extension that adds a new tab in the Activities overview where all the GNOME Shell themes (not GTK themes!) installed under ~/.themes show up. To change a theme, all you have to do is click it and you don't even have to reload GNOME Shell. The theme previews aren't exactly great, probably because of my large screen too, but the ThemeSelector GNOME Shell extension is still in beta. To use the ThemeSelector extension, you need to install GNOME Shell Extensions and the GNOME Shell User Theme extension. But don't worry, despite a first look on the installation steps below, installing all of these is actually quite easy. Read on! B. Convert Fedora .rpm to .deb (again not tested - thanks to ycDref for the tip!). This is an option for those who can't get GNOME Shell extensions to compile for some reason. Using alien is not recommended. And install the resulting .deb files (you can also directly install them using "-i" instead of "-d"). 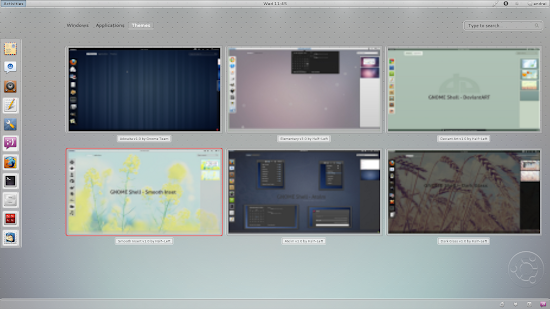 The ThemeSelector extension already comes with 5 great GNOME Shell themes by half-left: Atolm, Smooth Inset, Elementaty, Dark Glass and Deviant Art GNOME Shell themes. Here's how to install it. Download the Themeselector Gnome Shell extension, extract it and place "extension.js" and metadata.json under the ~/.local/share/gnome-shell/extensions/themeselector@fpmurphy.com/ folder (if it doesn't exist, create it). Then copy all the folders you've extracted to the ~/.themes/ folder (it's a hidden folder in your home directory; if some of those folders exists, merge the data). Now restart GNOME Shell and you should have a new Themes tab in the Activities overview. Post updated with a newer ThemeSelector version (0.9) - instructions for extracting the ThemeSelector changed! GNOME Shell Themeselector info and the extension itself - thanks to blog.fpmurphy.com; Many thanks to Charles Bowman for the tip!